crème fraiche | Can Men Cook? It’s a wonderful race back in time at Luton Hoo. You can see why so many film companies are drawn to it as a location. It’s not just the buildings and the opulence. The staff lives it too. I’d managed a sprained ankle while doing new years resolution early morning run. Tripped over a kerb. Out for 6 weeks. I was at a meeting and was driven there by my friend Sue Leach (who was the designer for my book, “Can Men Cook?” – and what a great job she did!). We had to ask at reception where Adam’s Brasserie was – and as it was 3 minutes walk away (or hobble away) they gave us a lift down. Lovely, old-fashioned service. The place is definitely Michelin style. 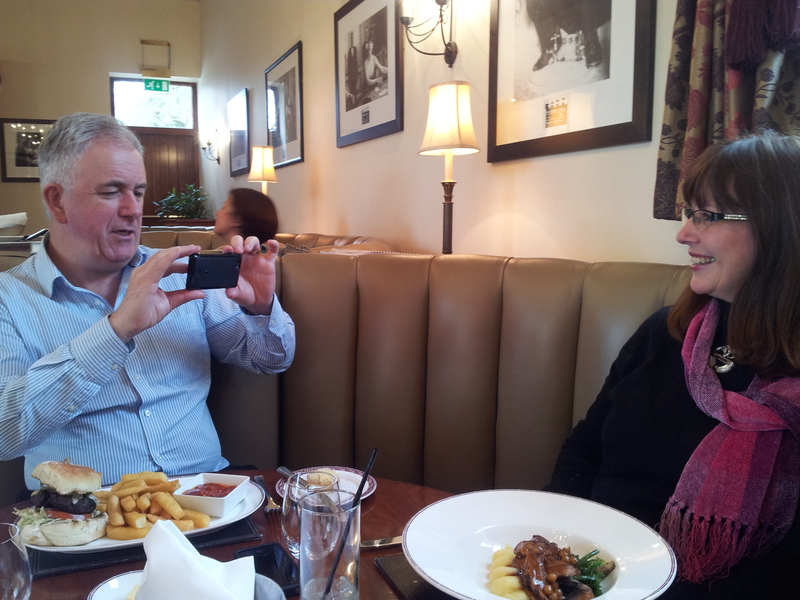 Mike Kean (another friend and colleague) was treating us to lunch – and what a treat. Here’s a taster (see what I did then?) of what we had. Smoked mackerel pate with a horseradish crème fraiche lemon salad and beetroot wafers. 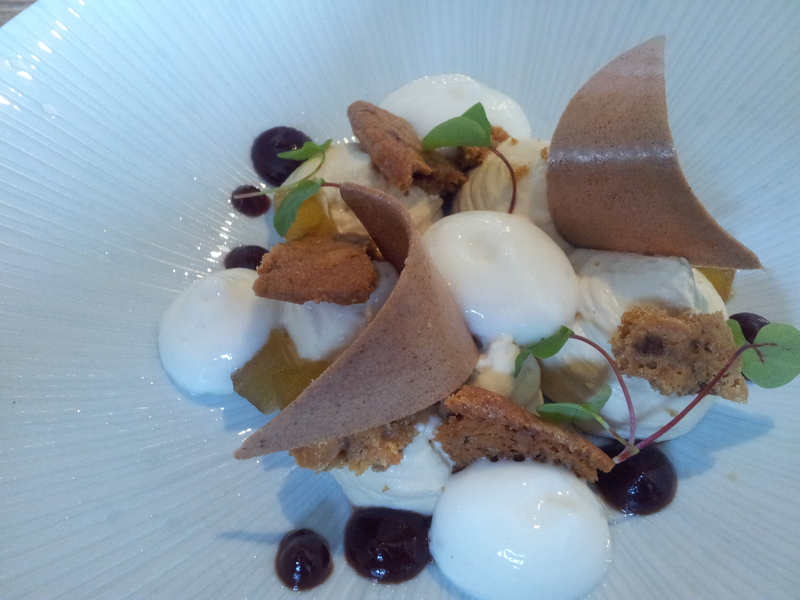 Not traditional at all – a quenelle of the pate, and the beetroot wafers were divine. The horseradish was de-heated by the creme fraiche and lemon. Loads of good feel to this. 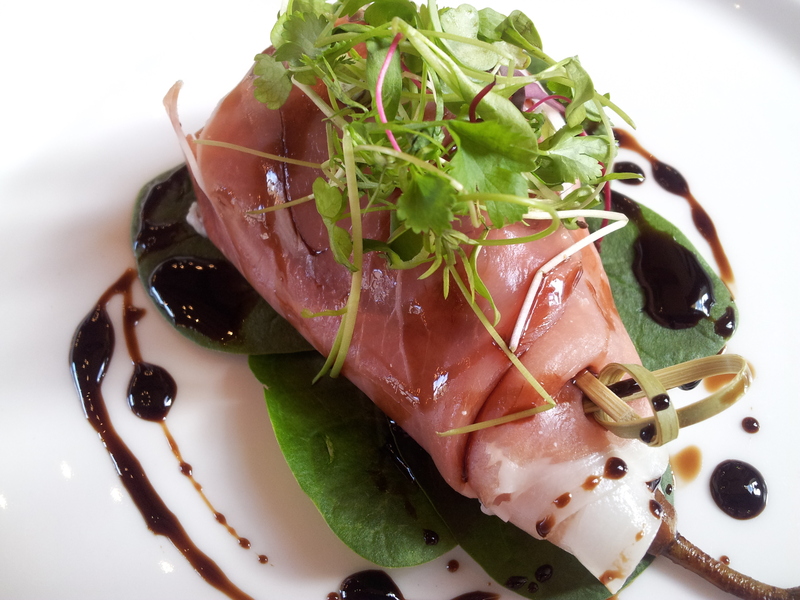 Red wine poached pears wrapped in Parma ham with baby spinach and a balsamic reduction. I’ve never considered using a poached pear like this. It works as an accompaniment as it was very tart – no sweetening added to the wine. Looks fun too, doesn’t it? 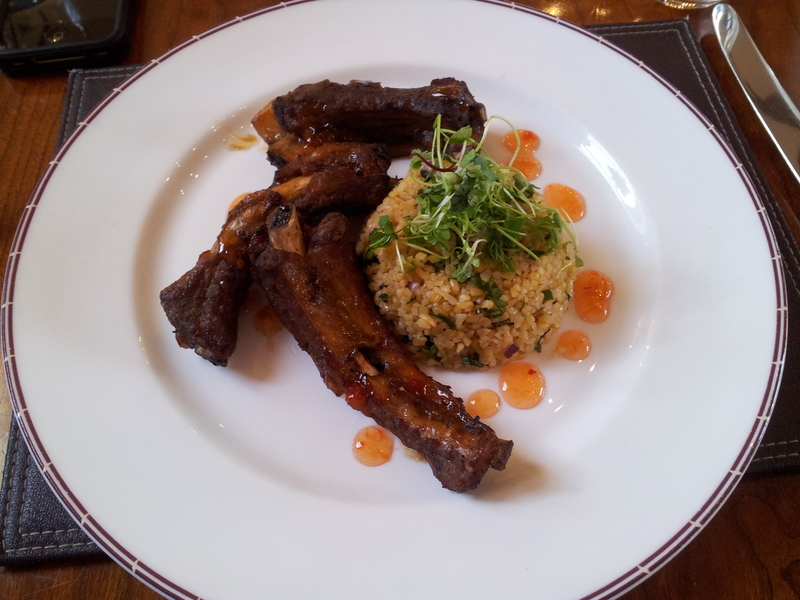 Slow roasted pork baby back rib with a spiced cracked wheat salad and chilli dipping sauce. OK – I did have choice jealousy at this stage. And I didn’t steal any, even though I wanted to. This is a golf course as well as a meeting place and spa. 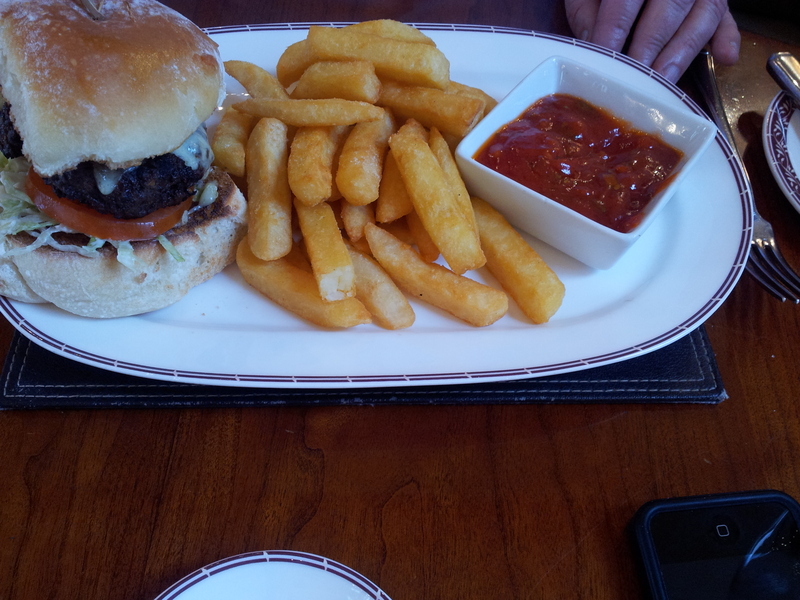 Mike went all golfer – and had the burger with triple fried chips! It was the full monty – bacon, cheese, but on focaccia bread (bit better than a burger bun! ), and the tart and hot tomato relish was rather good. 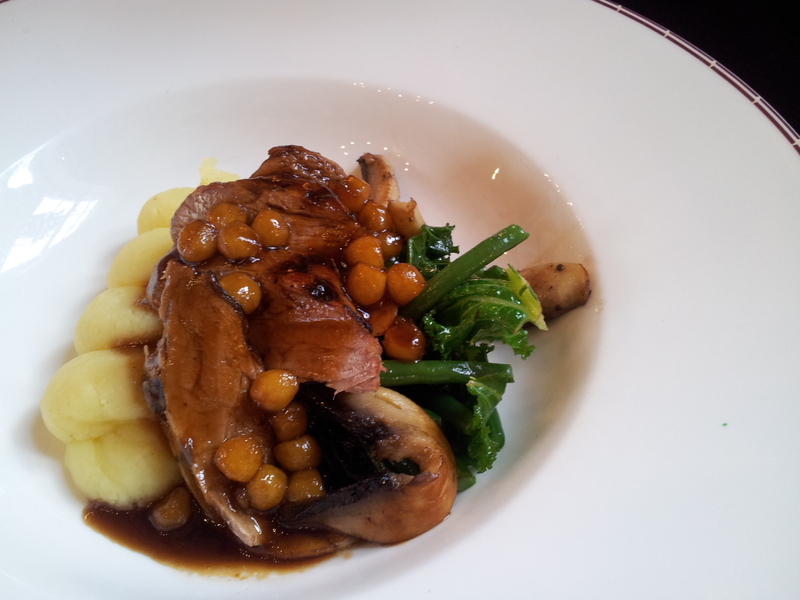 Sue had Dingly Dell Farm pork fillet, served with duo of apples (sweet and tart) sautéed greens and wild mushrooms. It wasn’t just a nice name and description, but I am sure many will be drawn to it for that – it was silence making in its richness. Sue is not a quiet person – so creating a lull is no mean feat – so the food definitely passed muster! 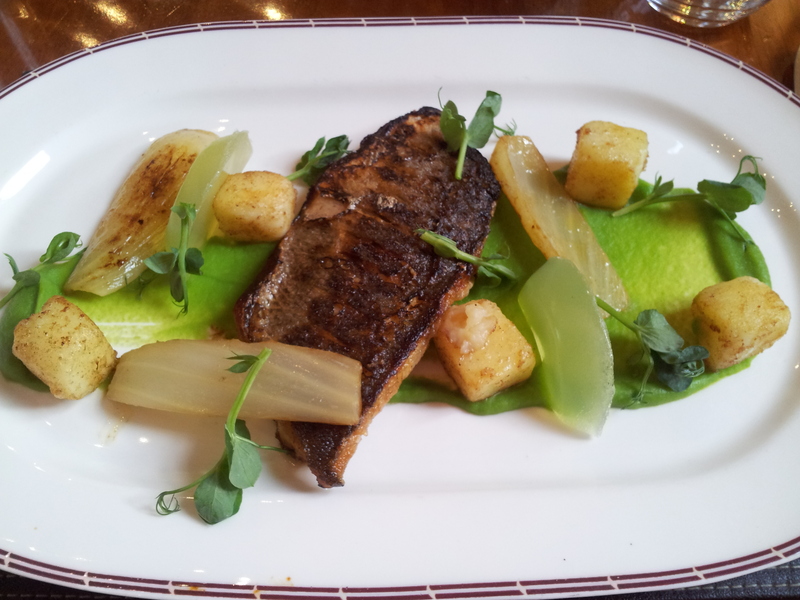 Fish of the day was sea bream – and we could smell the wafts of the sea 10 feet away – again, simple separate flavours, well executed and just fine dining. 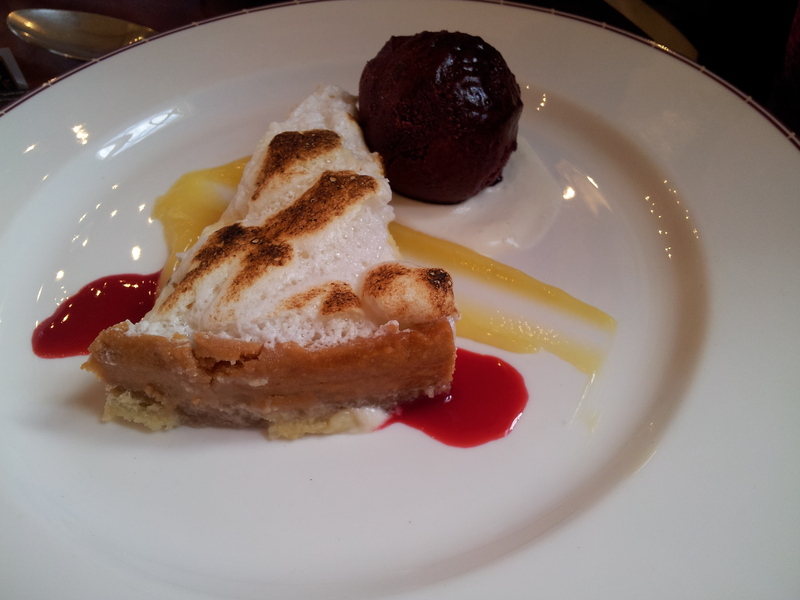 One of us had pud – lemon meringue pie. That was good, but the lemon curd took it up a notch, and the blueberry sorbet just exploded with delight. A clever menu, with enough variety to entice a jaded January palate. A great discovery in an unexpected place. Great lunch – thank you Mike.